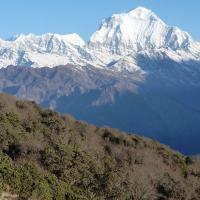 Nepal is well-known for travelers for different activities. Activities such as; trekking, rafting, wildlife, cultural and heritage activities are the main program to be covered. Thus, a visit Nepal is not enough. This program is not suit only for travelers but for the school and other group of People who wants to know more about Nepal from all perspectives such as geography of Nepal, Culture of Nepal,history of Nepal. e.t.c. With involving in these program you’ll be familiar with Nepal and It helps you to get dipper to know about Nepal. These programs are not only to entertain the people but it is created to give you some ideas to know about Nepal.So,these programme especially good for the students, club’s members and different group of people. There are numerous old monuments in Kathmandu which helps you to know about Nepalese cultural and religious life, there are numerous mountain rivers which have great potentialities of different activities and obviously the Himalayas of Nepal is the great attraction for all type of travelers. HappyHari staff will be waiting for you at the airport with holding a sign with your name. Once you meet the leader you will be warmly welcomed and transferred to your accommodation in Kathmandu which will require approx. half an hour’s drive. After check-in at the hotel and refreshing you will be briefed regarding your tour programme. No further programme planned today. 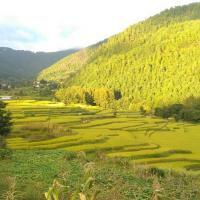 Today we will take you on a full day sightseeing tour through Kathmandu. We will show you the beautiful UNESCO world heritage sites such as Swayambunath and Boudhannath stupas as well as Pashupathinath temple. Now, time to get experience on mountain river.Trishuliis one of the best river to get the rafting experience in Nepal. The grade 3 rapids of this river with some birds and fisherman is the silent features of the river. About one and half hour drive takes you to the trekking start point and about 4 hrs walk will take you for overnight stay at the place called Hille. Uphill trail to Ghorepani is popular among the travelers but this is one of the best trail with good views of mountains through the Rhododendron forest. Early morning sunrise view from Poonhill(3193m) is the main highlight of this trek. So, it happens in here, today. After breakfast with the thrilling views of mountains mountain ridge trail leads you to the Tadapani. 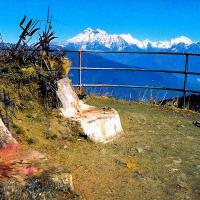 The downhill trail through the jungle will takes you to the Gorkha village called Ghandruck. Now about 5 hrs walk will lead you to the place called Nayapul where we started trek and there will be bus to take us to the Pokhara. 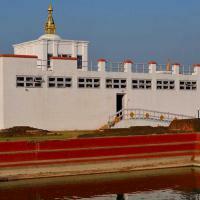 Now, we go to the Chitwan for different Jungle activities. Today,we will be involved in different activities such as, Elephant Saphari, Canoe ride, visit to elephant breeding centre.